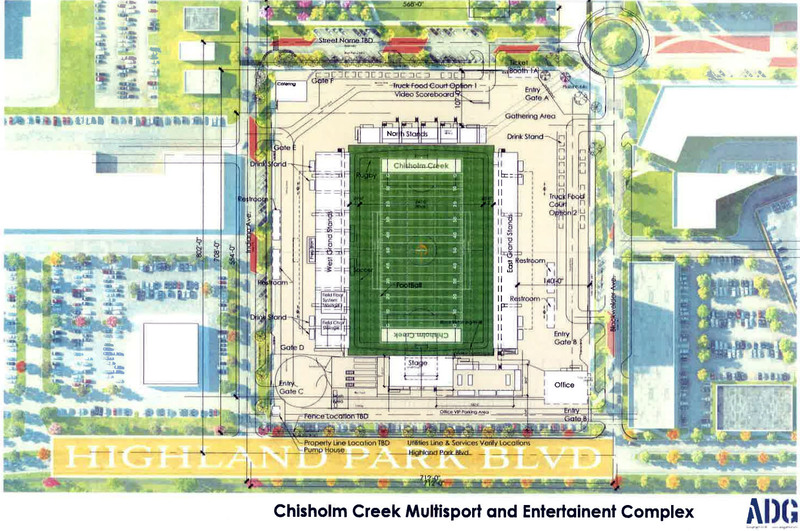 Although the application was submitted by an engineering company on behalf of an unknown client, the obvious implication is that this could be the future home for Oklahoma City's professional soccer team, The Energy. Plans show stands on all four sides of the stadium. Given the size and extent of the grandstand, it appears capacity would be between 5,000 and 10,000. 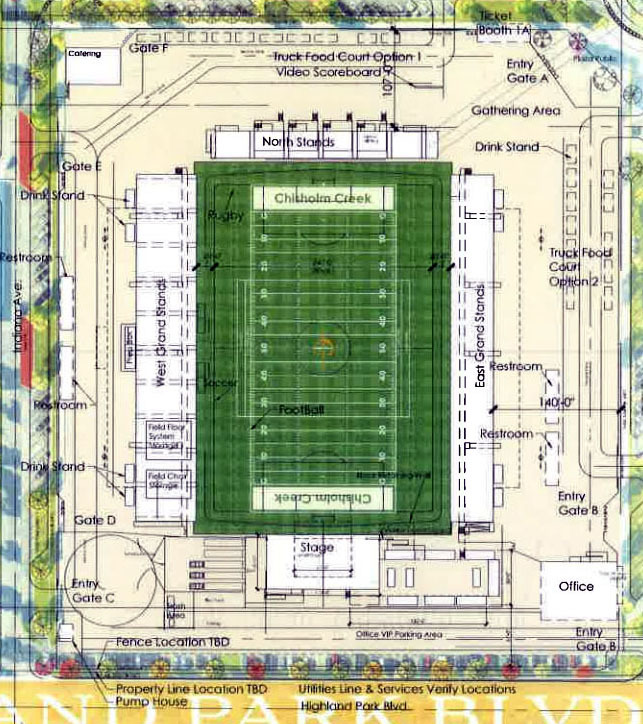 Also indicated are a small office building, controlled entry gates at each corner of the property, drink stands, restroom buildings, a video scoreboard, press box, ticket booth, VIP parking, and a removable stage at the south end of the field. The configuration appears to allow for future expansion of the east and west granstands. The planning application describes a “multisport and entertainment complex in order to accommodate team sports such as soccer, rugby, track and field and concert events”. The site plan designates two different options for a food truck park. The property is 13.11 acres and very near an 80-acre park being consctructed by the city to the south. The Oklahoma City Energy are owned by Prodigal LLC which is headed by Bob Funk Jr. The team was launched in 2014 and played its first season in Pribil Stadium on the campus of Bishop McGuiness High School. In 2015, the team moved to a newly renovated Taft Stadium which is owned by the Oklahoma City Public Schools. There has been much talk among fans that the current season would be the last at Taft, as the field is unusually narrow for a soccer facility and the Energy is the last team in their league to be playing at a high school stadium. The United Soccer League, of which The Energy is a member, has a stated goal of having each of its clubs playing at soccer-specific stadium by 2020. The Energy have been averaging about 4,000 spectators per game this season, with their largest crowd being 6,757. Looking for a long-term home, Funk had sought to purchase the 37-acre former Producers Coop property just south of Bricktown in 2016. The plan, which ultimately fell through, was to use 10 acres for a new soccer stadium and partner with investors to develop a mix of hotels, retail, housing and other uses on the balance of the property. Funk has expressed the desire for the Energy to ultimately join Major League Soccer (MLS) within 6 to 9 years. Previously a plan had been discussed to open a new stadium with near 10,000 seats and the capability to add 10,000 more as part of an MLS bid. If the Energy were to occupy this Chisholm Creek stadium, it would likely be a temporary home. Funk had previously expressed the desire to locate somewhere near the Oklahoma River. Engaging the large hispanic population on the near southside has been seen as an important long-term goal. Several professional soccer franchises have utilized 'pop-up' stadiums as a way of creating a dedicated soccer facility for their teams in a quick and efficient manner while continuing to work on longer term plans. 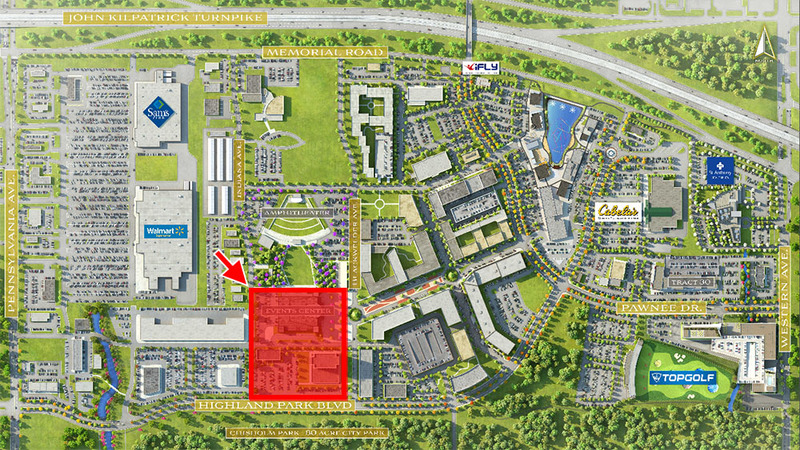 Chisholm Creek is a 190-acre mixed-use development featuring TopGolf, Cabela's, and many other retails and restaurants and bars. Recently, Uncle Julio's recently opened to long lines and several other restaurants are under construction including Birra Birra, Hopdoddy, Firebirds and Chalk. 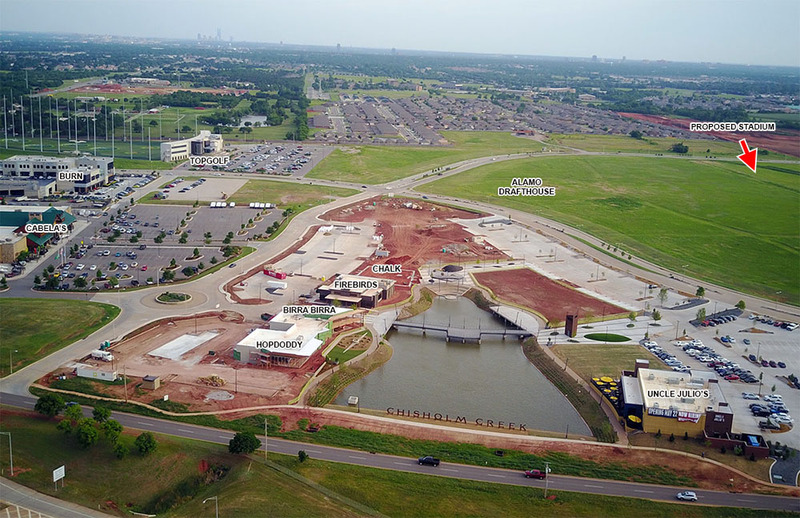 Negotiations are close to being finalized for Oklahoma's first Alamo Drafthouse and construction will start soon on Costco just to the east of Chisholm Creek on the southeast corner of Memorial and Western.